Snow Falling on the Hedge, a photo by randubnick on Flickr. Yesterday it started snowing around 8 AM. I decided I had better run out to the garage and bring in some supplies in case this turned into a big storm. By the time I had my boots on, the snow was coming down hard and starting to cover the sidewalk. On my way back to the house from the garage, the snow was falling on the hedge and it was so beautiful that I had to put down my bag of paper towels, frozen pizza, and bottled water so I could take some pictures. This is one of the best. Tonight I cropped it in iPhoto, and used the retouch tool to obscure neighboring houses just a bit. Well, it was about 8:15 AM when I took this photo. By 9 AM, the snow had stopped. By 11 AM, the snow was all gone. Is this really Massachusetts? Sunlight on Snowy Branches (Digital Woodcut), a photo by randubnick on Flickr. 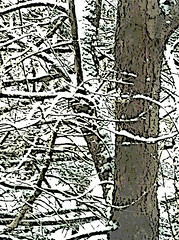 Here's one last look at this snow-covered tree, a digital woodcut. I used Painter to apply the woodcut effect. I used trial and error to get the number of colors and amount of black line that I wanted. The colors are more subdued, but the woodcut effect emphasizes the lines. 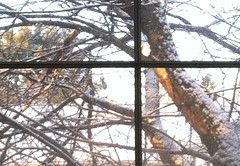 Sunlight on Snowy Branches (Posterized Photo), a photo by randubnick on Flickr. Sunlight on Snowy Branches, a photo by randubnick on Flickr. It snowed last Friday, and this is the scene I saw when I looked outside. I took this picture through an upstairs window about ten past 8 AM. I was trying to capture the morning light on this scene. This photo has been digitally modified, but very slightly: I used Painter to clear up a little distraction on one of the branches with some digital pastel. I also used iPhoto to crop and adjust the contrast just a bit. Paper Roses Collage (Posterized Version), a photo by randubnick on Flickr. This image began with a collage of paper roses that I made almost five years ago (final version posted here April 13, 2007). This week, I loaded my photo of the original version into Zazzle to use for a greeting card and other items, but the resolution was too low to get a good size image and well, it just didn't look good. The cast shadows of pasted paper look good when the collage is seen on its own, but become distracting when the image is imposed on another surface. So tonight I opened the photo of the original image in Painter, and changed the resolution. Then I used some digital pastel to cover some of the dark shadows cast by the pasted paper. Then I posterized the result, experimenting with the amount of posterizing effect till I got what I want it. I am happy with the result. l think it will look better in e-mail greetings, and I hope it will work better for making paper cards, as well. Snow, Field, and Trees (Digital Woodcut), a photo by randubnick on Flickr. Last night I used Painter to apply a woodcut effect to the photo that I took recently at Bradley Palmer State Park. Today I decided it needed some color, so I used iPhoto to adjust the red and blue tint. 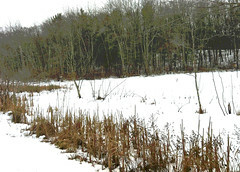 Snow, Field, and Trees (Posterized Photo), a photo by randubnick on Flickr. Tonight I used Painter to posterize the photo I published here yesterday, a picture that I took recently at Bradley Palmer State Park, in Topsfield, MA. I thought posterizing might add some interesting effects to the trees and grasses. I experimented with exposure as well as the amount of posterizing effect until I got the look I wanted. I also created a digital woodcut version of this image and plan to post it here tomorrow. Snow, Field, and Trees, a photo by randubnick on Flickr. This is a photograph that a took a couple of days ago during a walk at Bradley Palmer State Park, in Topsfield, MA. We had stopped for a quick walk with the dog after a visit to the vet. I liked the way the grasses and trees looked against the snow, so I took some pictures with my iPhone camera. Tonight I used iPhoto to do some light editing on this one: straightening, adjusting the exposure, and then cropping to get this composition. 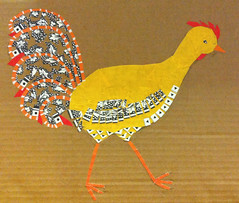 Chicken Collage Day 14 (January 23, 2012), a photo by randubnick on Flickr. 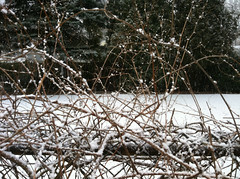 Snow on Blueberry Bushes, a photo by randubnick on Flickr. Here north of Boston, we finally got some snow! The first snowfall was on Friday morning, and despite the cold, I went out to take some pictures with my iPhone camera because I knew the snow would be gone soon (and I was right). 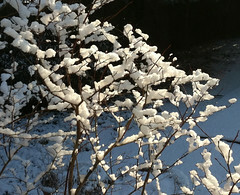 I was admiring the way the new snow looked on the blueberry bushes in the morning light, so I took some photographs. Tonight I used iPhoto to crop the best one to get this composition. But apart from cropping, this is the image just as it looked when it came out of the camera. 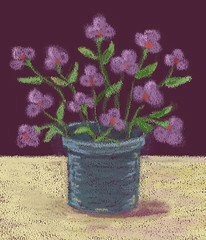 Pink Flowers (Digital Pastel Day 3), a photo by randubnick on Flickr. Tonight I went back to the digital drawing I have been working on (in Painter, on my Mac). I wanted to add some definition to the flowers. But I had cornered myself by creating flowers that seemed to have three petals. Even though I am working from my imagination, I wanted to do a little research so I Googled flowers with three petals, and found some. 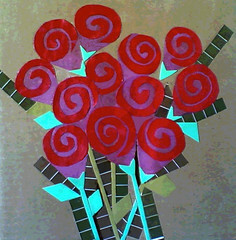 But in the end I decided to go with a shape that suggested a bud surrounded by opening petals. I drew a few lines on one of the flowers and decided I could make that work. Then I added highlights and shadows to the flowers and flowerpot, added a few more leaves, and put some soil into the flower pot. Then I spent some time cleaning up, straightening lines, etc. Finally, I cropped the image one more time. I think this is pretty much done, although no doubt I will find mistakes that I will want to fix. 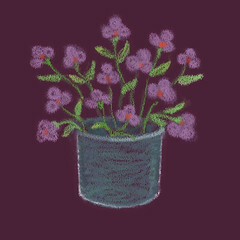 Pink Flowers (Digital Pastel Day 2), a photo by randubnick on Flickr. Today I worked on the digital drawing that I started last night, a little still life in Painter's digital pastel. First I changed the shape of the container (using a grid to keep it centered). Then I drew a line to indicate the table-top, and used yellow to add light and complement the dark purple background. Then I put in a little bit of shadow and highlight. Finally I cropped the image to get a better composition. This is still a work in progress. To be continued. . . . 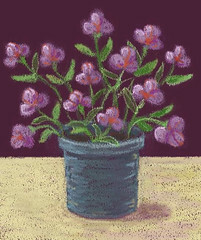 Pink Flowers (Digital Pastel Day 1), a photo by randubnick on Flickr. This is a work in progress. Tonight I decided to do another drawing on the computer, because it is fun and good practice. 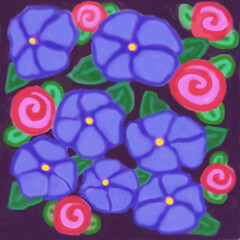 I thought I might draw more flowers, easy to do when I am drawing from imagination. I started a new file in Painter and chose a dark background, and used digital pastel. The dark background really made the digital pastel "texture" show up, and it kind of felt like I was drawing with chalk on a chalkboard. I started with pink circles, and went from there. I used a grid overlay to straighten out the lines. I worked for about an hour, but couldn't spend any more time on this tonight. So this is what the drawing looks like now. I plan to continue tomorrow. . . . Snow Across the River (Digital Woodcut), a photo by randubnick on Flickr. 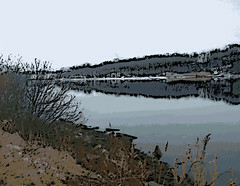 Yesterday's image was a posterized version of a recent photo that I took of a riverbank here in Beverly, MA (from the vantage point of a walking path behind a local Starbucks). Tonight I decided to see what the image would look like as a digital woodcut. So I copied the photo and opened it in Painter. It took a lot of trial and error (including adjusting brightness and adding posterizing) and fiddling with the controls to get the right textures in the right places. I transferred the image back into iPhoto. I decided to adjust the tint (more blue, more red) to get more interesting color. Anyway, here is the final result. Snow Across the River (Posterized Photo), a photo by randubnick on Flickr. It snowed this morning (finally), just an inch or so, and the temperature was rising into the mid-thirties. 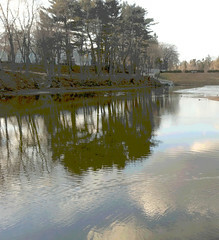 But I was on the run and didn't get a chance to take pictures until late afternoon, when we stopped to walk the dog on the path by the Bass River, behind the Starbucks here in Beverly. 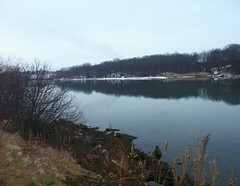 There were still some traces of snow accentuating the line of the riverbank, so I took some pictures. This was the best of the bunch, so I opened it in Painter, cleaned up some distractions in the foreground with digital pastel as well as some cut-and-paste, and then did some selective posterizing. Then I cropped it to get this composition. Sky in the Water (Digitally Modified Photo), a photo by randubnick on Flickr. This image began with a picture that I took during a walk at the Cummings Center Pond here in Beverly, MA, back on January 10. The air was clear and you could see the clouds reflected in the water, along with the ripples in the pond. So I took some pictures. Last night I opened the original photo in Painter. I used digital pastel to obscure the houses behind the trees, as well as to hide a series of flagpoles. 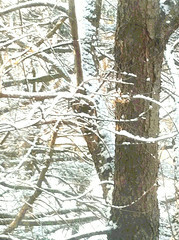 Then I posterized the image and cropped it to get this composition. Pixel Posies (Posterized), a photo by randubnick on Flickr. Last night I used Painter to create this posterized version of the image I posted yesterday, a little drawing of roses and violets that I created on the computer. The posterizing adds some interesting textures and brightens the color, but I prefer yesterday's version, and that's the one I am more likely to use. Pixel Posies (Roses and Violets), a photo by randubnick on Flickr. Yesterday I started this little digital drawing in Painter, beginning with some squiggles and working for a couple of hours until I had a drawing of digital posies. All day I was thinking about changes I wanted to make. Tonight I used Painter to do a lot of clean-up and definition, but I only made one real change: I added yellow to the centers of blue-violet flowers to yellow so they would be the right color for violets. So now I have red roses and blue violets. So I am thinking of using this for a greeting card on Zazzle. (February 14 is just a month away.) I also created a posterized version of this, just out of curiousity. I will post it tomorrow. Pixel Posies, a photo by randubnick on Flickr. Tonight I decided that I felt like drawing something in Painter on my Mac, but I didn't have anything specific in mind. I decided to start with a doodle. I used soft digital pastel, and just made some purple swirls, and then some pink ones. I intended to make a quick drawing, but I kept going for two hours, and this is what it looked like at 11:30 PM. (Time to go to bed.) Maybe I will do more with it tomorrow, but I think I am done . . . for tonight, at least. Powdered Sugar Morning (Digital Woodcut), a photo by randubnick on Flickr. We had a light dusting of snow a few days ago, and in the morning it looked just like powdered sugar. I took a picture of the this tree in the morning light and posted it here a few days ago. Yesterday I published the posterized version. This version is a "digital woodcut". I used Painter to apply the "woodcut" effect to the photo. ( I used a lot of trial and error to get the colors I wanted as well as the amount of black line.) Afterwards I edited it in iPhoto, increasing the yellow and pink tones just a bit, to capture the look of the morning sunlight. Powdered Sugar Morning (Posterized), a photo by randubnick on Flickr. Yesterday it finally snowed, just a light dusting. I took a picture through the window and posted it last night. Tonight I used Painter to create this posterized version of it. I also created a digital woodcut which I plan to post tomorrow. Powdered Sugar Morning, a photo by randubnick on Flickr. This morning, I was surprised when I looked out the window and saw snow on the ground. Why the surprise? It is January 10, and this is only the second snow of the year, both of them pretty light. This time, it was just a little dusting of snow. The forecast was for a quick rise in temperature today, so I knew the snow wouldn't last. I liked the way the morning light looked on one of my favorite trees, so I took this picture through a window with my iPhone camera. Tonight I edited the original image in iPhoto, straightening it and cropping it to get this quirky composition. Pineapple Stroke-by-Stroke a video by randubnick on Flickr. 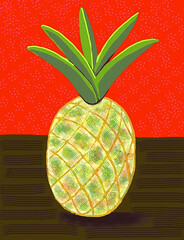 For the past two days, I have been posted my little drawing of a pineapple, created on my iPad with the Brushes app. Brushes captures a "stroke-by-stroke" video as you draw, so here it is. I used iMovie to add the still of the final drawing at the end. Pineapple Revised - Cropped, a photo by randubnick on Flickr. 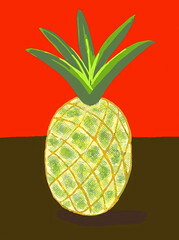 Yesterday I used the Brushes app on my iPad to draw a picture of a pineapple, and posted it here. I thought it was finished, but I guess it wasn't. When I saw the image on the computer screen, I decided I wasn't satisfied with the background. And I saw a few other things I wanted to change. Oh well, I could let that go. But then I had the idea of adding more pattern, and that sounded like fun. So I got the iPad out, and started making changes. I added pink polka dot texture to the wall in the background, and purple stripes to the table top. I also added more definition to the leaves, and added more color to the pineapple. I am happier with it now (though the background still looks different on the computer screen than on my iPad.) Brushes captures a stroke-by-stroke video, so tomorrow I plan to post a little animation of this pineapple coming into existence. Pineapple Drawing - Final, a photo by randubnick on Flickr. I went to Starbucks late this afternoon and took my iPad along. I decided to draw with the Brushes app while I had a hot chocolate. That gave me enough time to get this drawing started. I was just drawing to draw, no purpose in mind, and for some reason decided to draw a pineapple. (I had been to the grocery store about an hour earlier, but I didn't look at the pineapples.) I worked from imagination and memory. I didn't have time to finish, but after dinner, I worked on it some more. Once I got the drawing into iPhoto, I cropped it just a bit to center the image. Brushes captures a stroke-by-stroke video as you draw, and I hope to post my little pineapple video tomorrow. Tall Winter Grasses (Digital Woodcut), a photo by randubnick on Flickr. 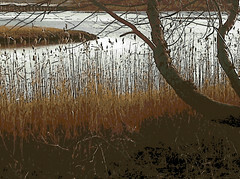 Tonight I used Painter to turn my photo of winter grasses into a "digital woodcut" by applying the woodcut effect. At first, I was losing the soft yellow no matter what I did with the woodcut controls. So I decided to apply a soft yellow overlay to the whole image, and then tried the woodcut effect again. That seemed to solve the problem and I was able to get some soft yellow highlights. Tall Winter Grasses (Posterized Photo), a photo by randubnick on Flickr. Here is another image from the New Year's Day walk at Obear Park, here in Beverly, MA. 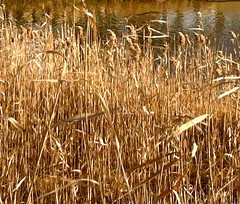 I liked the golden winter light on the tall grasses, so I took some pictures. This version was posterized in Painter and cropped to get this composition. It seems odd to be taking so many pictures of beach grass! But we haven't much snow at all this winter, so less snow means more access to the beach, and a clearer view of the grass. Toward Salem (Digital Woodcut), a photo by randubnick on Flickr. This image began with a photo that I took on New Year's Day at Obear Park, here in Beverly, MA. I took the picture looking toward the old drawbridge to Salem. 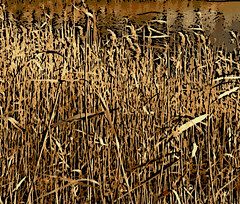 (It still works) I liked the look of the tall grasses and the shapes of the tree branches and shore line. Yesterday I published the posterized version of the photo that I created in Painter. I also created this digital woodcut from the same image. Toward Salem (Posterized Photo), a photo by randubnick on Flickr. Yesterday I posted a photo that I took on New Year's Day during an afternoon walk at Obear Park, the view of the drawbridge to Salem. Tonight I used Painter to create this posterized version of the photo. I also created a digital "woodcut" which I plan to post tomorrow. Toward Salem, a photo by randubnick on Flickr. The weather was great yesterday so we took the dog and went to Obear Park, here in Beverly, MA. This time we took a different way into the park, and this was the view, looking toward the old drawbridge (still in use) that goes to Salem. (You can see the bridge in the upper left-hand corner of the photo.) I liked the texture of the tall grasses, so I started taking pictures, and got interested in this slightly quirky compositiion. 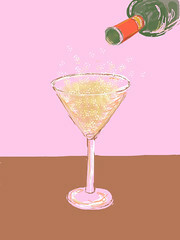 Champagne (Digital Drawing), a photo by randubnick on Flickr. Last night, New Year's Eve, I posted an animation of a champagne glass being filled. This was a stroke-by-stroke video created in the iPad's Brushes app as you draw. Tonight I am posting the drawing as it looked when I was finished.